Yes you heard right True Believer! Two great heroes that hero great together! Later this year, the two most popular characters in the world are together for their very own ongoing series! 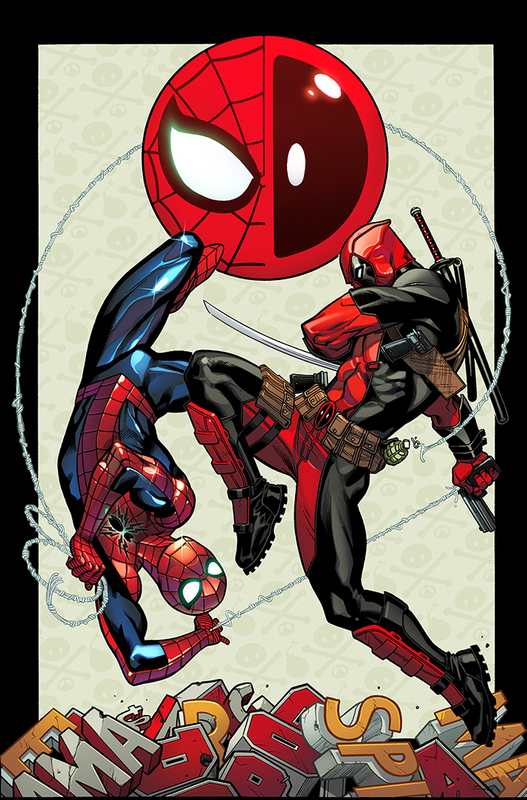 That’s right – SPIDER-MAN/DEADPOOL #1 is coming your way, chock full of wallcrawling, wisecracking and bad guy punching! Blockbuster creators and the legendary Deadpool creative team of Joe Kelly & Ed McGuinness reunite once more to chronicle the ongoing adventures of Peter Parker and Wade Wilson! But what to call this terrible twosome? The Merc-y Neighborhood Deadpool? The Spider with a Mouth? They’ll figure it out eventually. Deadpool LOVES Spider-Man. Spider-Man hates Deadpool. Sounds like a perfect match! So what on Earth could be enough bring these two together for a titanic team-up in the merry Marvel manner? “I will say that there is an assassination involved, a case of misplaced trust and their names are on the book so they sort of have to show up,” says writer Joe Kelly speaking with Marvel.com on what unites the two. This Fall, the Marvel Universe’s newest odd couple is taking comic shops by storm. Be there as the webs and bullets fly as Kelly and McGuinness bring you SPIDER-MAN/DEADPOOL #1!